We have information that PDP thugs, true to our predictions since December 2018, have now mass-produced vests and other APC logos with which they are going around Kwara State to destroy things and attack innocent citizens. This is an old tactic for which the #PDP and its patrons are known. We recently alerted the people of Kwara to this evil tactic of the PDP. Armed with guns and other deadly weapons, they are wearing the same #APC vests and filming themselves as they carried out this act of violence against Kwarans. 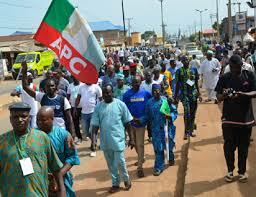 An example was what they did today (Sunday 13 January) in Surulere area of Ilorin in the state capital. This was the same tactic they deployed in 2003 and other election periods. These are panicky measures adopted by the drowning dynasty which has lost the battle of ideas. We remain committed to running a peaceful, issues-based and decent campaign. Again, we call on the security agencies to arrest this ugly trend. We reiterate our position that politicians must seek people’s votes through superior arguments and campaign pledges, not through violence and propaganda for which the PDP is now known all over Nigeria.